Sometimes, premonitions can be so subtle we can make fools of ourselves by not recognizing them for what they are. In 1973, I was a pest control guy and spent a lot of time driving from one customer's house to another in Fort Lauderdale, Florida. The cars they supplied us with had radios, no tape decks, so I listened to the radio all day. 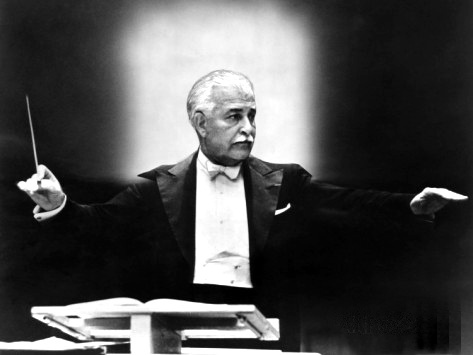 On July 10, I heard the news report the death of Arthur Fiedler, conductor of the famed Boston Pops symphony orchestra. I had a number of his recordings and never missed his show on PBS on Sunday nights, so I was saddened to hear this. According to the radio, he had collapsed after a concert, of a heart attack, and died. Of course, Evening At Pops continued to run on Sundays and I continued to watch, appreciating the show all the more knowing that Fielder had died and these shows, taped before then, were all that remained of him. Whenever I mentioned to anyone that Fiedler was deceased, they would be surprised. Apparently, I was the only person who'd actually heard his obituary. But given that I was in my early twenties and my friends were the same age and also pest control technicians, this wasn't too surprising. When the fall season started and Fiedler was still conducting, I was somewhat surprised. I knew TV shows didn't usually tape a full year in advance, but this was PBS and maybe they did things differently. 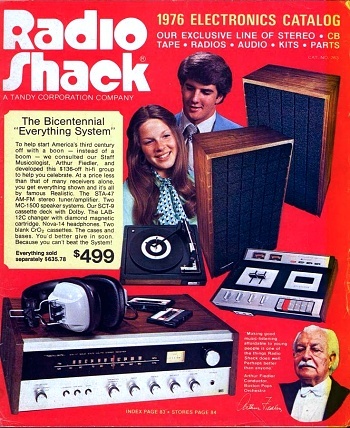 In late December, Radio Shack issued its 1974 catalog, which featured an Arthur Fiedler caricature dancing on the pages, but I realized this had probably been in the printers' for months so I forgave them what might otherwise be thought of as really bad taste. However, in 1975 when Fiedler remained the spokes-cartoon for Radio Shack, I was less forgiving. It seemed like blatant commercialism, and I didn't care whether Fiedler's family had given permission or not; it was in poor taste. I refused to shop at Radio Shack because of it. That paled, however, to the mind-boggling bad taste shown by PBS at the beginning of the 1975 fall season of Evening at Pops. The country had started celebrating America's bicentennial, and Evening at Pops featured an animated opening with a star-spangled Arthur Fiedler dancing around the screen. I was horrified. It was one thing, a fine thing, to be running old tapes of the brilliant conductor every Sunday night. It was quite another to create an animation of him as if he were still alive, and to use it to celebrate the bicentennial. And then, in 1977, they re-ran an episode of Evening at Pops with guests artists The Carpenters. The show, according to the announcer had been originally taped in 1974…after I had heard Fielder's obituary. I began to suspect he wasn't dead. By 1979, I had accepted the reality that Fiedler was very much alive. When conversations of weird things came up, I would always tell the story of the false obituary I had heard for Arthur Fiedler, and how I had mourned him for years when he was still alive, especially on the anniversary of his "death," July 10. Then…on July 10, 1979…it was reported (again) that Fiedler had died. He had collapsed after a concert, of a heart attack, had been taken to the hospital and released, only to die the next morning at home. I had, apparently foreseen (or fore-heard) this event six years in advance. Why? I didn't know Fiedler personally, or anyone else who did. There was no one I could have "warned" that might have altered future events. Of course, there's another possibility that didn't occur to me until much, much later. It has to do with the parallel Earths I seem to have traversed once or twice. What if, on some variant of the Earth we live on, that world's analog of Arthur Fiedler did die on July 10, 1973? And somehow, a broadcast of that Arthur Fiedler's obituary is what I heard? I have since been confided in by others who've have the same bizarre experience of witnessing something newsworthy that seemed perfectly acceptable at the time, but later seems to have never happened at all. Anyway, today is the 27th anniversary of Arthur Fiedler's passing. Thanks for the tunes, Art. Come back soon.